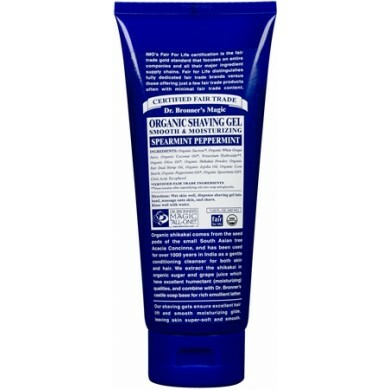 Dr. Bronner's Shaving Gel Spearmint Peppermint is smooth and effective without any synthetic ingredients. Organic Shikakai comes from the seed pods of the small South Asian tree Acacia Concinna. 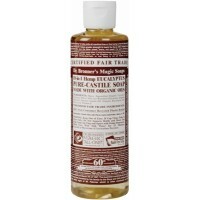 Extracted in organic sucrose and grape juice it provides soothing moisturizing glide. How to use: Wet skin well, dispense shaving gel into hand, massage onto skin, and shave. Rinse well with water. For all international orders there is a 2kg limit. If your order is over 2kg, it will be cancelled and fully refunded. Albania, Andorra, Armenia, Austria (EU), Azerbaijan, Azores (EU), Balearic Islands (EU), Belarus, Belgium (EU), Bosnia Herzegovina, Bulgaria (EU), Canary Islands, Corsica (EU), Croatia (EU), Cyprus (EU), Czech Republic (EU), Denmark (EU), Estonia (EU), Faroe Islands, Finland (EU), France (EU), Georgia, Germany (EU), Gibraltar (EU), Greece (EU), Greenland, Hungary (EU), Iceland, Irish Republic (EU), Italy (EU), Kazakhstan, Kosovo, Kyrgyzstan, Latvia (EU), Liechtenstein, Lithuania (EU), Luxembourg (EU), Macedonia, Madeira (EU), Malta (EU), Moldova, Monaco (EU), Montenegro, Netherlands (EU), Norway, Poland (EU), Portugal (EU), Romania (EU), Russia, San Marino, Serbia, Slovakia (EU), Slovenia (EU), Spain (EU), Sweden (EU), Switzerland, Tajikistan, Turkey, Turkmenistan, Ukraine, Uzbekistan, Vatican City State. We will send you a confirmation email once your order is dispatched. After that you should normally receive your order within estimated shipping time. However some delays in the Royal Mail services are possible especially during festive seasons. *PLEASE NOTE: COSNATURAL WILL NOT TAKE RESPONSIBILITY FOR ANY IMPORT TAXES OR DUTIES IN THE DESTINATION COUNTRY. ANY CUSTOMS CHARGES ARE THE SOLE RESPONSIBILITY OF THE CUSTOMER AND YOU WILL NEED TO PAY IT DIRECTLY TO THE LOCAL CUSTOMS AUTHORITIES. IF YOU HAVE ANY QUERIES REGARDING IMPORTS TAXES OR DUTIES, YOU SHOULD CONTACT YOUR LOCAL CUSTOMS SERVICES BEFORE PLACING YOUR ORDER. 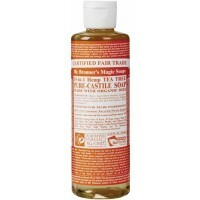 Dr. Bronner's Tea Tree Castile Liquid Soap is made with tea tree extract, a natural antiseptic that ..
Dr. Bronner's Eucalyptus Castile Liquid Soap opens your pores and clears your sinuses while envelopi..
Alba Botanica Cream Shave Mango Vanilla is soothing and smoothing for normal to dry skin. Power-pac..